David Spade and Kate Spade during Photographer's Gallery Presents Slim Aarons Curated by Kate Spade at Fred Segal Cafe in West Hollywood, California, United States. Kate Spade died Tuesday of an apparent suicide. 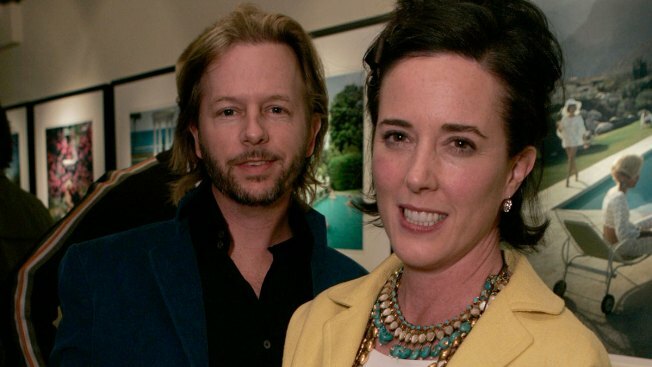 Comedian David Spade was among the thousands who expressed their mourning following the death of Kate Spade on Tuesday. The former "Saturday Night Live" star's brother Andy had been married to the iconic designer since 1994. "Fuzzy picture but i love it. Kate and I during Christmas family photos. We had so much fun that day. She was so sharp and quick on her feet. She could make me laugh so hard. I still cant believe it. Its a rough world out there people, try to hang on," Spade captioned the undated photo. Spade, 55, was found dead of an apparent suicide in her Manhattan home on Tuesday. According to The Associated Press, a note had a message for Spade's 13-year-old daughter, who was at school at the time saying that it wasn't her fault. Spade's sister, Reta Saffo, said she believed the fashion icon had bipolar disorder and it gone untreated.